The Islandora Camp is coming to Lib4RI, Eawag! DORA, our institutional repository, is based on the Islandora open-source framework. 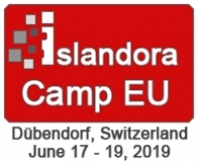 Therefore, we are happy to announce that we will be hosting the 2019 Islandora Camp this year here at Eawag, Dübendorf. The event takes place on 17-19 June 2019 and will cover a variety of topics surrounding the Islandora framework, including an administration and a development track. This is a great opportunity to exchange ideas, developments, learn and discuss with other Islandora specialists from all over the world. This event may be of interest also to individuals that are not familiar with Islandora itself. Islandora is a Drupal module to interface to Fedora repositories and makes use of technologies such as SOLR. Therefore, code and solutions for these topics may be presented as well. The deadline for proposal-submission is 15 February 2019, whereas for early-bird registration 1 April 2019. Should you have any questions, do not hesitate to contact us by email to publicationservices@lib4ri.ch or contact the Islandora Foundation.